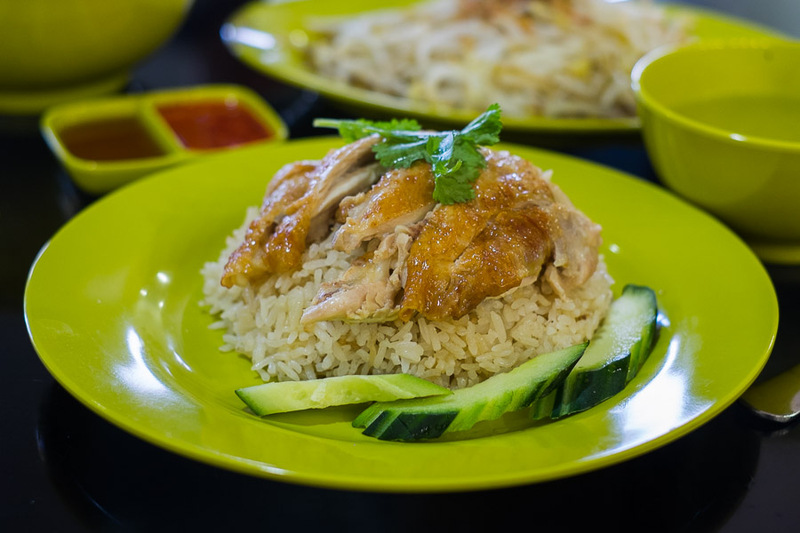 In our perpetual quest for Malaysian/Singaporean/Hawker-style breakfast, we found Chicken Rice Corner a few months ago, open at 9.30am on weekends (10.30am weekdays) in an Asian food court in Canning Vale. I know some of you guys are fans of this place. 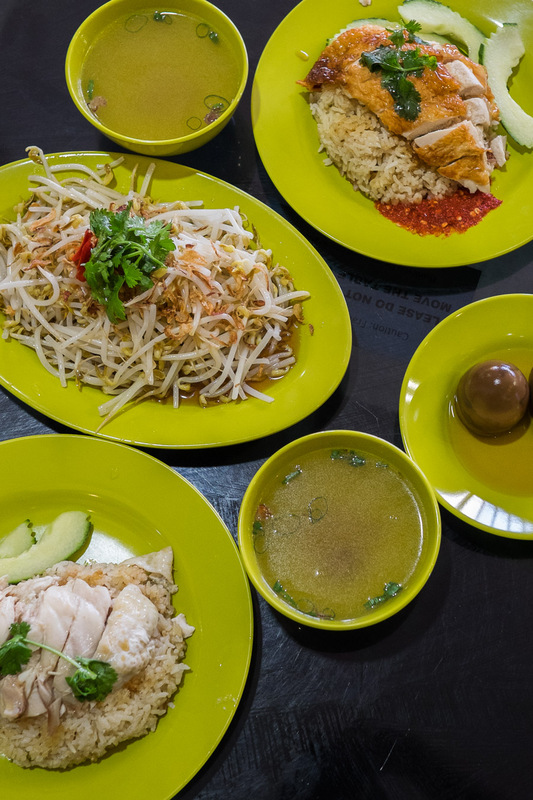 In Malaysia (where I lived until age 10) and in Singapore, hawkers tend to specialise in a dish, often a closely guarded family recipe, expertly prepared. If you crave wantan noodles, you go to the wantan noodle stall; if you feel like nasi lemak, you go to the nasi lemak stall. You want satay, go to the satay stall. 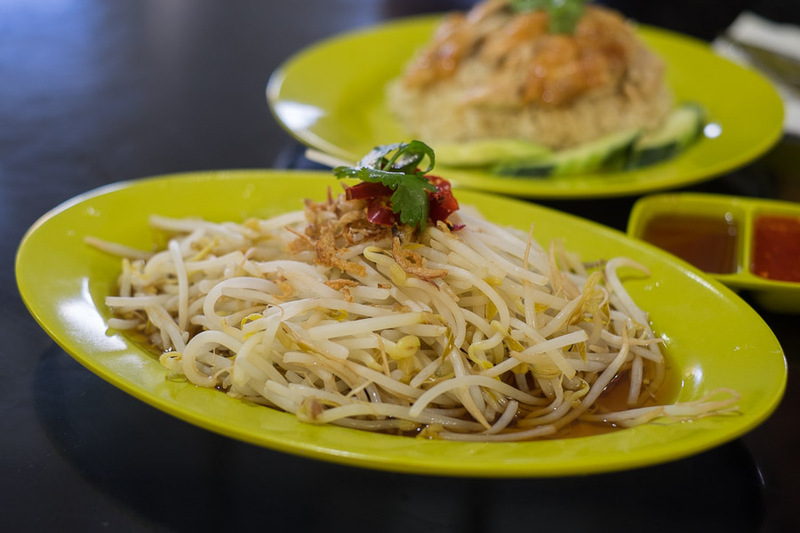 The hokkien mee stall, the rojak stall, the BBQ chicken wing stall, the fish ball soup stall, the char kway teow stall, the bak kut teh stall, the prawn noodle stall, the oyster omelette stall, the pig’s organ soup stall… you get the idea. Chicken Rice Corner reminds me of that specialist hawker tradition, as they sell chicken rice (Hainanese or Roast chicken) and a selection of side dishes to go with the chicken rice: bean sprouts, bok choy, homemade egg tofu with choy poh (preserved radish) or braised soya eggs. And that’s all they serve – though they’ve recently added chicken laksa on weekends. The chicken rice and laksa are AU$6.50 each. With a side dish or two, it’s a great value meal. Today’s $18 breakfast consisted of chicken laksa, roast chicken rice and a plate of bean sprouts. We added iced teh tarik and iced Milo from the drinks stall for a grand total well below $30. 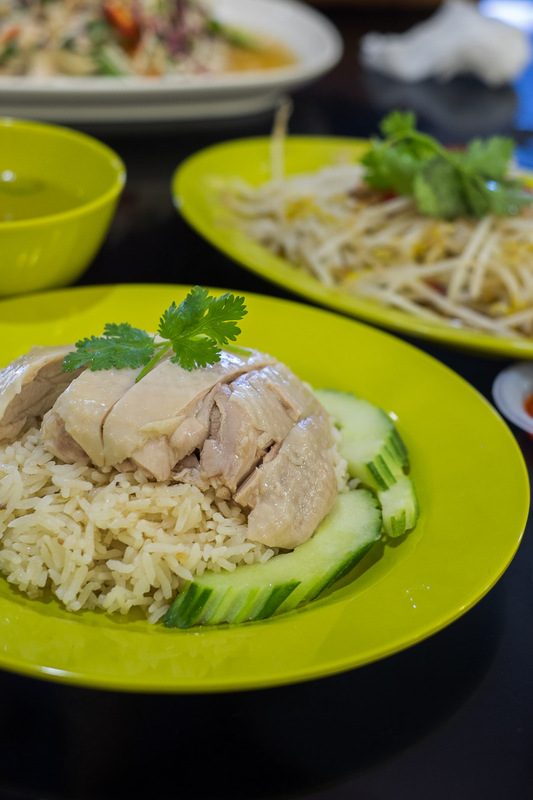 Our first meal at Chicken Rice Corner was Hainanese chicken rice, roast chicken rice, stir-fried beansprouts and a couple of soya eggs. When dining in, you can help yourself to as much chilli sauce and soy sauce as you like. Having tried both chicken rice variations, Jac prefers the roast chicken rice. 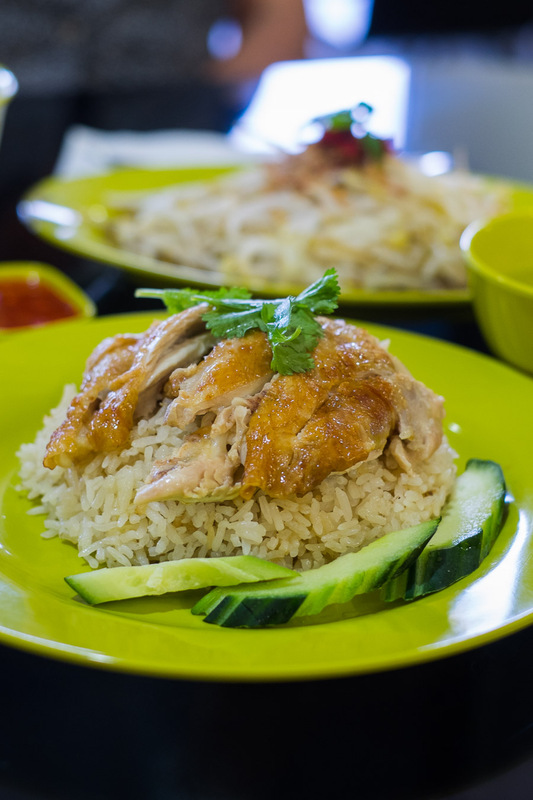 I prefer the Hainanese chicken rice. 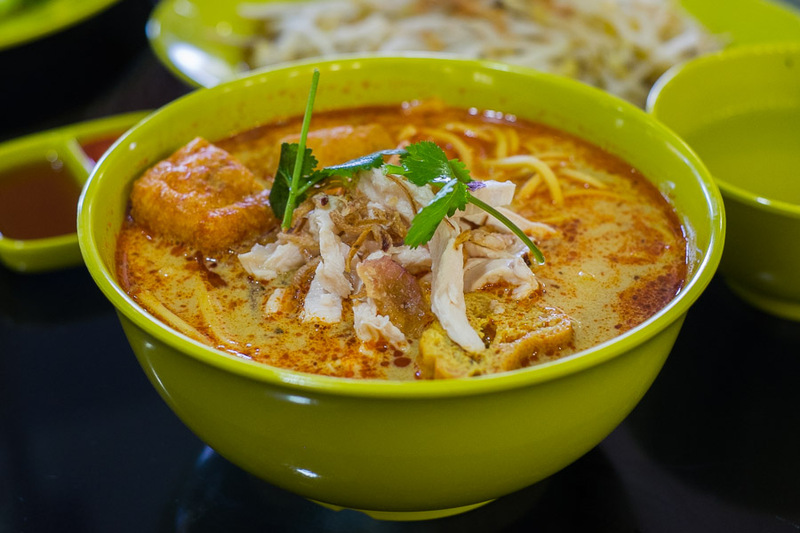 The weekend special chicken laksa is a hearty bowl of egg noodles, bean sprouts, shredded chicken, fish cake and tofu puffs in a rich, fragrant broth. I will definitely have this again. We’re still to order the tofu and bok choy as the bean sprouts have been irresistible so far. We’ve ordered dessert after a Chicken Rice Corner breakfast – prata bom from the Indian/Malay stall called 2 Brown Men. 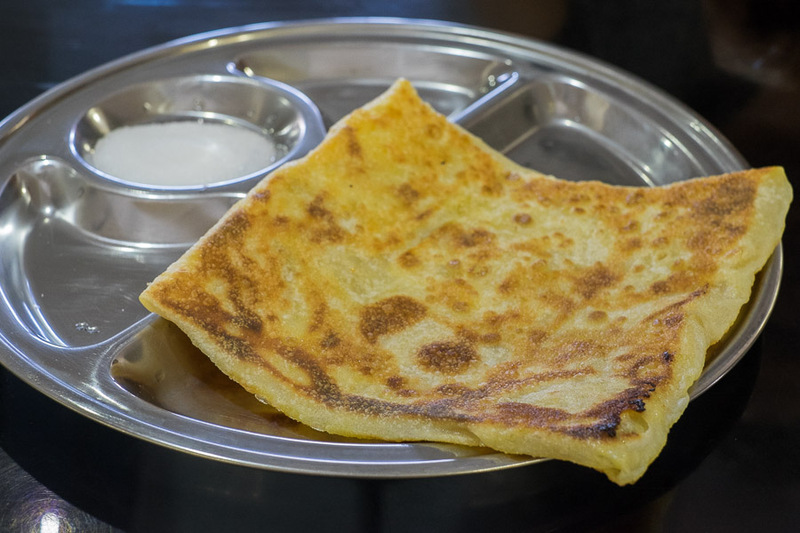 The square prata bom was crisp, flaky and incredibly buttery, served with white sugar. On a future visit, I hope to try 2 Brown Men’s prata and curry (my sister Juji has and thought it was very good). just tear, dip, eat, repeat. Chicken Rice Corner and 2 Brown Men are clearly the most popular stalls here. The other stalls include Thai, Vietnamese, Chinese, Indonesian and Malaysian. The drink stall I mentioned earlier sells the usual range of Malaysian-style drinks, like teh tarik, kopi, Milo and so on. I can even get my fave, an A&W root beer float. Open 10.30am on weekdays, 9.30am on weekends. Not all stalls open at the same time, and I’m unsure of the exact closing time. Closed on Tuesdays. 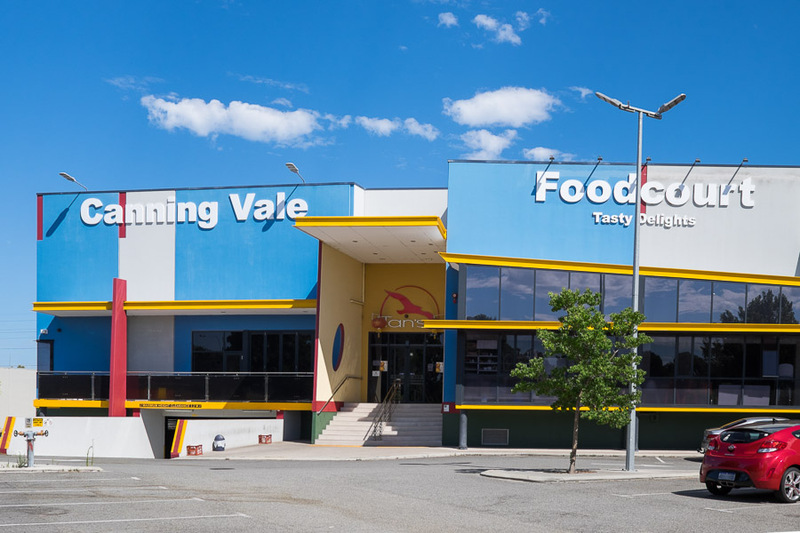 I’m not sure of the name of the food court – I refer to it ‘Canning Vale Food Court’ but the name above the door suggests it may be ‘Tan’s Food Court’. 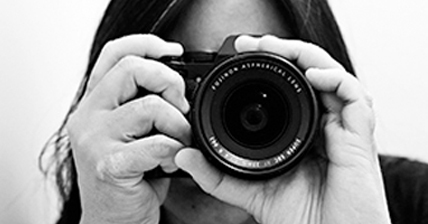 Within walking distance of a decent Asian food court – just imagine… I would be there all the time.